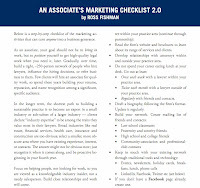 Here's one of my most popular marketing tools -- the Associate Marketing Checklist – By Year of Practice. It sets forth step-by-step exactly what I think lawyers and other professionals need to do at every stage of their associate careers, so that when they've matured in their legal practices or are eligible for partnership, they'll have laid a solid marketing and client-development foundation. As an associate, your goal should not be to bring in work, but to position yourself to get high-quality legal work when you need it, later. Gradually, over time, build a tight, ~250-person network of people who hire lawyers, influence the hiring decisions, or refer business to them. 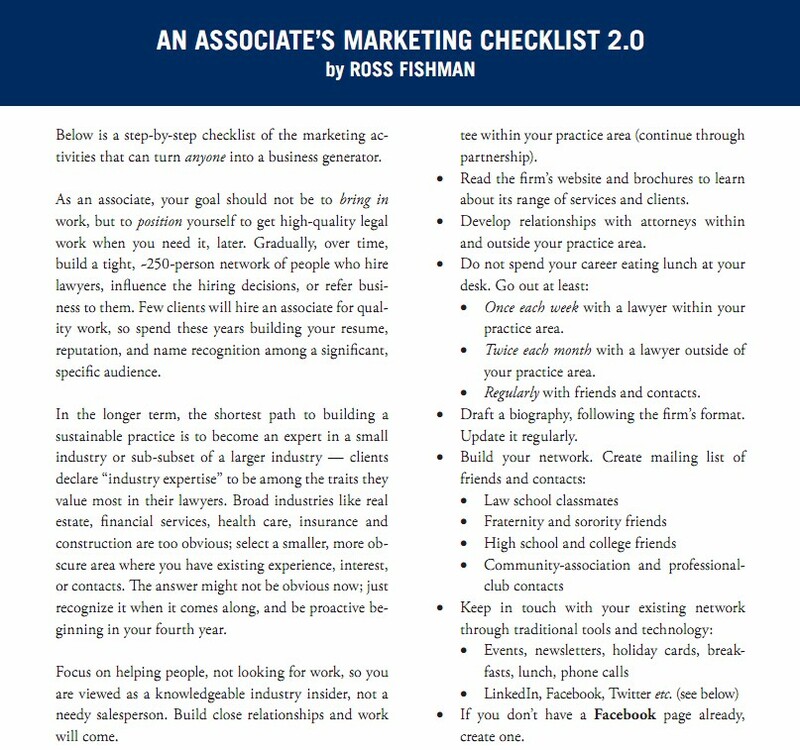 Few clients will hire an associate for quality work, so spend these years building your resume, reputation, and name recognition among a significant, specific audience. In the longer term, the shortest path to building a sustainable practice is to become an expert in a small industry or sub-subset of a larger industry — clients declare “industry expertise” to be among the traits they value most in their lawyers. Broad industries like real estate, financial services, health care, insurance and construction are too obvious; select a smaller, more obscure area where you have existing experience, interest, or contacts. The answer might not be obvious now; just recognize it when it comes along, and be proactive beginning in your fourth year. Focus on helping people, not looking for work, so you are viewed as a knowledgeable industry insider, not a needy salesperson. Build close relationships and work will come. Feel free to distribute it around your law firm or accounting firm – but please keep the copyright notice on it.